Blowout Sale! 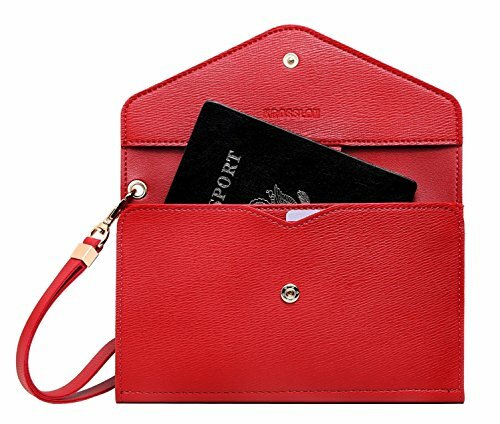 Save 72% on the Krosslon Travel Passport Holder Rfid Blocking Tri-fold Wallet Document Organizer Bag with Wristlet, 11# Agate Red by KROSSLON at Smart Air Flights. Hurry! Limited time offer. Offer valid only while supplies last. NOTICE : YOU CAN CHOOSE THE DIFFERENT MODEL (2.0 OR 1.0) WITH COLOR NAME. NOTICE : YOU CAN CHOOSE THE DIFFERENT MODEL (2.0 OR 1.0) WITH COLOR NAME. Krosslon will continuously manufacturing the wallet with trending colors that can easily be accessorized to match the daily casual occasion. Like airports, crowded market places, buses, trains, sporting events and festivals. Our products are warranted to be free from defects in materials and workmanship for 180-Days from original date of purchase when used under normal conditions and for the purpose intended. Mannerly customer service and Quick response support, hassle-free! Click "Add to Cart" now! Stylish design, Model 1.0 : the wallet is sleek, versatile and slim if you prefer a bulky one. We've designed this travel wallet to help you made the trip easier. Uniquely look, Mild Contrast stitch decorating wallet more vintage and old-fashion style. With continuously trending colors that can easily be accessorized to match the daily casual occasion. Size : 7.5 x 4.5 x 0.8 inches. Rfid Protection : built in Rfid blocking material will safeguards your personal information from unauthorized scanning under frequency 13.56 MHz. It's blocking credit card readers from the Identity thief, protect the privacy and peace your mind. Durable Material : we choose the Eco-friendly Double-faced Lamination leatherette that sustainably produced and chosen for their durability and lightweight performance. Meet the environmentally certified standards, such as REACH of Euro, EN71 and CA Prop 65 of US. Easy Organization : Open flat, you can easily organize your travel needs such as Passport, Boarding pass, Credit cards, Travel member card, ID, Sim card, Coupon, Fly tickets, Cash money, Coins, Key, Pen and Cell phone With removable wristlet make sure the wallet always stay with you when carry-on. If you have any questions about this product by KROSSLON, contact us by completing and submitting the form below. If you are looking for a specif part number, please include it with your message.